Industrial finishes are custom formulated to individual and end-user requirements. Successful selection depends on a close working relationship between users and suppliers. Selection should be strictly on a demonstrated film performance basis. This is because the film performance of a thermosetting powder coating is completely dependent on the bake it receives in a particular plant, on a particular substrate, with a particular degree of cleanliness, and type of metal pretreatment. Many specialties in the marketplace can cross over the guidelines. Because of the mushrooming effect of this technology, areas of formulation expertise are developing that can stretch some of the characteristics of a particular generic type, making it perhaps a more economically viable alternate under specific plant circumstances. In selecting a thermosetting powder type, such key factors as demonstrated film performance, demonstrated application characteristics, and cost performance balance should be kept in focus. A summary of the key properties of each generic type of thermosetting powder coating is presented as follow. Tough and flexible. Excellent chemical and corrosion resistance. Excellent mechanical properties. Poor exterior color/gloss retention. Decorative film performance. Very good chemical and corrosion resistance. Very good mechanical properties. Fair exterior color/gloss retention. Thin film powder applications. Good chemical and corrosion resistance. Good mechanical properties. Very good exterior color/gloss retention. 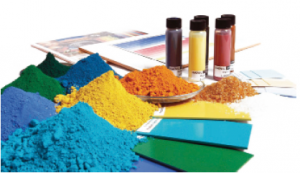 Thin film powder coatings. Good chemical and corrosion resistance. Poor mechanical properties. Excellent exterior color/gloss retention. Decorative film performance. Very good chemical and corrosion resistance. Good mechanical properties. Fair to good exterior color/gloss retention. Operating temperatures from 400′ to >1000″F (204 to >538’C). No matter which coating is selected for a particular application, the health and safety aspects of the actual fully formulated and color-matched material to be used must be fully determined. This information should be requested from the supplier since it can be of great significance to the final application.